Explicit instruction can advance word knowledge and usage. Vocabulary, or the repertoire of words that an individual knows and uses to communicate, is key component of effective reading from the earliest stages and is central to comprehension. Students cannot understand what they are reading if they do not know what the words mean. Additionally, comprehension degrades proportionally to unknown vocabulary. Most words are learned through everyday language experiences. Interactions with adults are the best way for children to expand their vocabularies. Through sharing of events and books, adults provide knowledge and stimuli that children need. Once individuals are fluent readers, books and other types of written communication are optimal for expanding vocabulary and concepts. Despite the fact that most vocabulary is acquired indirectly, research suggests that vocabulary can be improved with explicit instruction. Direct instruction helps students to learn words that have not been mastered from life experiences. It can be provided through oral discussion that familiarizes students with vocabulary words, often offered before a story or text lesson is read. These introductory vocabulary lessons also aid comprehension. The discourse teaches the words and lays groundwork for the content that is to be covered. If students are to remember the words and make them part of their working vocabularies, they need repeated exposure and additional practice using the words over an extended period of time. Ambiguities of the English language make learning words a challenge. Multiple meanings, spellings, and pronunciations confuse students and hinder verbal or written communication. Direct vocabulary instruction develops awareness of synonyms, antonyms, homonyms, and heteronyms. Lessons or manipulatives can teach students both words and specific strategies. Structural features of words offer clues to meaning. Prefixes are added before root words to modify the meaning. Since prefixes carry meaning, being familiar with them can be valuable for vocabulary expansion. Suffixes are added to the end of words to change the part of speech. If students can identify the root word and determine the part of speech, often they can figure out what the word means. Root words also have meaning. Study of Latin root words and the many words that can be formed from them is a powerful strategy for analyzing word meaning and expanding vocabulary. Another technique that is worthwhile for advancing word concepts is classification, or the ability to categorize vocabulary words into classes. When using categories, students consider words in terms of their class membership rather than as separate entities. 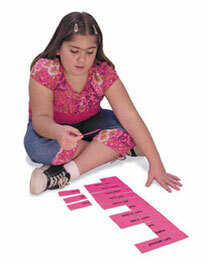 Students can be asked to sort words by categories or find words that do not belong. Word relationship analysis, such as analogies, is a type of classification skill. In addition to vocabulary improvement, studying classes and relationships builds reasoning skills. The English language has been strongly influenced by other languages over the centuries, particularly by Latin and Greek. Understanding the structure of these two western classical languages affords many insights into the formation and meaning of English vocabulary words. Greek and Latin are inflecting languages in which words and usage are modified by the addition of prefixes and suffixes. Familiarity with prefix meaning, suffix usage, and the most common Latin roots can provide clues for figuring out tens of thousands of words. Suffixes added to the end of words affect usage rather than meaning. Most commonly, suffixes denote verb tense, noun plurals, or adjective degree. Understanding these uses improves grammar, but does not build vocabulary. However, recognizing how suffixes are utilized to modify parts of speech can be a worthwhile meaning-analysis strategy. Identifying the usage might help a reader to get the gist of what is being said. Frequently occurring Latin roots and their variant forms are potent vocabulary builders. Just learning the top 25 would offer insight into innumerable English words. Some that are more straightforward, such as port or scribe, may be learned with little instruction. However, structured lessons would unlock many others. These words are examples of the Latin root mit, miss, which means to send or let go. The word meanings in parentheses couple both the root and prefix meanings. The suffix -onym is derived from the Greek word for name. Words that end in -onym refer to a category of words. Often the class is based on relationships between word pairs, such as synonyms and antonyms. Other classes have spelling, sound, or meaning similarities or differences, such as homonyms or heteronyms. Knowledge of the following word types is necessary for vocabulary use and spelling accuracy. Of all these groups, synonyms are most significant for vocabulary improvement. Synonyms are words that have the same meanings. However, synonyms often have different connotations or tone, and considering these features leads to more accurate choices. 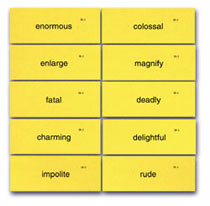 Additionally, some words are quite overused (good tops the list), and students must strive to select alternate words. The built-in thesauruses in word processing programs are excellent tools for today's writers. Before students maximize this feature in their writing, they must be cognizant of word nuances and repetition. Manipulatives provide structured study of synonyms that make students think about synonyms as they write and train them to consider word choices. Antonyms, or words having opposite meanings, are useful for concept and vocabulary understanding, but they do not improve usage. For instance, if you say that superb is the opposite of poor, most students would comprehend the word meaning. But would it be preferable to say that superb is another word for outstanding? Focusing on synonyms is the superior strategy. Homo comes from the Greek word meaning one. Homonyms are two words having the same pronunciation but different meanings, origins, or spellings. Rather than bogging down with additional terminology, Reading Manipulatives uses this inclusive definition of homonym to refer to words that are pronounced the same but have either different spellings (to, too, two) or meanings (bat-device for hitting baseballs, bat-flying nocturnal animal). Heteronyms are words that are spelled the same, but they differ in both meaning and pronunciation (reocord v, recoord n). Students figure out heteronyms on their own by using context. However, heteronyms can be used in creative ways to demonstrate the idiosyncrasies of English and test the writing skills of students. Manipulatives are effective for improving vocabulary through synonym association and substitution. Manipulatives could also be used with antonyms, but antonym matching is not as worthwhile as either a vocabulary development or writing strategy. Before moving students into manipulatives or skills cards, be sure that they know what synonyms, antonyms, homonyms, or heteronyms are. Introduce these concepts one at a time and follow the lesson with some type of activity. Step 2 - Make sets of manipulatives and skills cards Comprehensive sets of manipulatives and skills cards assure that key vocabulary words are covered and that students have adequate practice to master skills. This proves to be far more beneficial than the random lessons that are generally used. These sets become part of the daily assignments. The initial time invested is returned as students repeatedly work on the materials and as they are reused with future classes. Homonyms are best taught through writing since they must be spelled and used correctly. Sets of skills cards that trigger sentences and cover high-use homonyms are helpful. Homonyms or heteronyms provide worthwhile sentence-writing activities. Students can demonstrate correct usage of homonyms or heteronyms in the sentences while improving general composition skills. 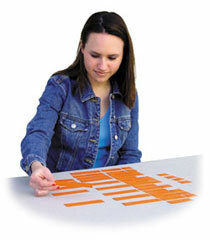 The sets of skills cards can be incorporated into daily work routines. Consider making the homonyms, synonyms, or antonyms part of some weekly spelling lists. Students tend to focus on their list words, and immersion helps students remember the concepts. Additionally, homonyms are spelling nemeses for many. For example, one extensive analysis of student-writing samples listed improper use of its and it's as the leading error. Teach word use at every opportunity. Research suggests that words are not mastered without repeated exposure, with four being the average that is necessary. Students may understand the characteristics of the word categories, but they will not retain individual vocabulary words unless they practice these words over time. English words, especially nouns, are often joined to express a single item or idea. Most compound words are closed into one word, but some remain separate words and some are hyphenated. All forms are included in the resource list. As the list illustrates, there are not many English compound words that are not joined. Here are a few examples of compounds that are two words or contain a hyphen. Often in English, two or more words are joined to form an adjective. These compound modifiers are hyphenated. The combinations vary and are not listed as compound words in dictionaries. 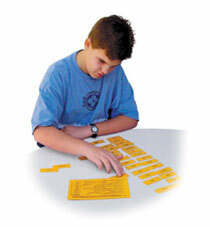 With compound manipulatives, students learn new vocabulary and concepts as they work their way to the final matches. They also improve thinking and organizational skills. If using the right and left justified sets, students should first sort the words. The first half of each compound is right justified and has the code on the left. The second half is left justified and has the code on the right. Once sorted, students should arrange all the first parts in a vertical column. Then they take each second part and go down the column until a match is found. Occasionally there is more than one possibility. Since all cards must be matched, this leads students to the correct choice. Centering the words makes this a far more challenging activity. Instead of knowing the beginnings and only having to match the endings, now students must deal with all words that can go in either position. 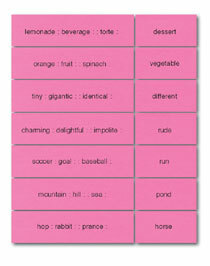 Students should simply arrange the words in lines or columns and begin to make matches. Analogies require learners to use higher-level thinking strategies to associate two words that are not commonly linked and ascertain what relationship exists between the two words. Once the implied analogy pattern (synonyms, antonyms, homonyms, degree, part to whole, function, characteristic, etc.) is determined, the task is to create a similar relationship for the next pair of words. Analogies are used to develop and test vocabulary since students must know the meaning of the words in order to complete an analogy. Analogies are a type of word puzzle containing two pairs of words, both of which are based on the same type of relationship. The first pair of words is given, along with the first word of the second pair. Students must determine the relationship that exists between the first pair of words and then complete the second pair with a word following the same pattern. An analogy must always have parallel structure. For instance, if the relationship is part to whole (mattress to bed), the second pair cannot be whole to part (sofa to cushion). It would have to be: mattress is to bed as cushion is to sofa. Since analogies are a method for developing or testing vocabulary, students are hindered when they are unfamiliar with words that are among the choices. For instance, in this analogy (lemonade : beverage : : torte is to _________ / choices: casserole or dessert), one must know the word torte to know that dessert, not casserole, is the correct choice. Vocabulary expansion is a goal, so students must look up words that they are unsure of. The Reading Manipulatives Analogies Match are leveled by vocabulary difficulty and include various types of word relationships. Analogies are perfect for developing reasoning and vocabulary. This issue explains the skill, shows how to make analogy match-ups, and includes a resource list broken down by relationship type.